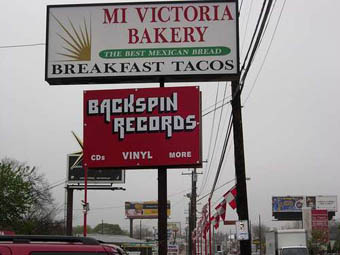 TOP You’re co-owner of Backspin Records with Zach Douglas. How did you guys come up with that name? EW We wanted a name that referenced vinyl. Backspin is what DJs do, so we went with that. TOP Backspin, huh? I like the lingo. I’m not very well versed in the world of records. I only have some because people say they’re cool now. What kind of advice would you give to somebody who wanted to start a record collection? What should they look for in a record player? EW First of all, a record player requires a receiver with either a phono input or a preamp. A lot of the new receivers only have auxiliary inputs, so you’ll have to purchase a separate preamp if this is the case. You can find older refurbished record players that tend to last longer than the newer models. TOP This might seem elementary, but what is the proper way to clean and store records? EW You can usually just use a soft cloth to wipe the record if it gets dirty. You want to try to keep the records upright and in plastic sleeves to protect from dust. They don’t like to be stacked on top of one another, and they don’t like extreme temperatures. This could cause them to warp. Also, they don’t like moisture. TOP Sounds more like Gremlins. This might sound elementary again, but why are some records bigger than others? EW Right, there are different sizes of records. Basically an EP record (extended play) is usually going to be either seven inches or 10 inches. An EP usually just contains a few songs while an LP (long play) record is 12 inches and contains much more music. TOP I’ve noticed that records have this number etched into them. What is that? EW That’s the matrix number. TOP Speaking of movies, have you seen Shaun of the Dead? TOP Do you feel comfortable being around all of these lethal weapons? I guess it makes you feel pretty safe? EW I don’t know if a record would really be able to do that much damage. They’re like light Frisbees. You’d need to get a shard stuck in a soft spot to do anything. See, look. [He tosses a Missy Elliot LP in my direction.] They’re pretty light. TOP Whoa, careful. Are you trying to attack me with a Missy Elliot record? EW Ha, yeah – that Missy Elliot record is a weapon. 4803 Airport Blvd), where he’ll be the celebrity monologist at Stool Pigeon. You can say you’re with the DJ, but that might not get you in.